All Sevens were built using a space-frame of steel tubes reinforced by aluminum panels. (However, the Series 4 had a fiberglass tub bolted to the frame). The front suspension was clever in that the forward link of the upper A-arm was formed by the antiroll bar, a typical Chapman technique of making one component serve the purpose of two. The Series 4 used conventional Aarms. 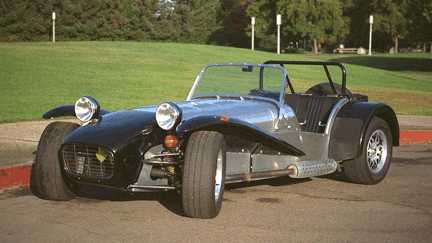 For comparison, the Lotus 6 used a beam front axle hinged in the middle. Engine: Ford 100E 1172 four-cylinder flathead. Bore: 63.5 mm. Stroke: 92.5 mm. Compression ratio: 8.5: 1. Single Solex carb. 40 bhp at 4500 rpm. Optional engine: Twin SU carbs, four-branch exhaust, stronger valve springs, reworked head with higher compression ratio to give 48 bhp. Transmission: Ford 3-speed. Close-ratio gears optional. Nash Metropolitan rear axle, standard diff ratio 4.875: 1. Options: 5.375: 1 to 3.73: 1. Front: Unequal length A-arms with anti-roll bar forming forward link of upper A-arm. Rear: Live axle located by twin trailing arms and diagonal link. Coil-over shocks front and rear. 15" wheels. Twin-leading shoe hydraulic brakes, 8" cast-iron drums front and rear. Mechanical hand brake. Steering: Initially Burman worm and nut box, later Morris Minor rack-and-pinion, both located behind front axle. Triangulated spaceframe, 1" and 3/4" 18 ga. square and round tube. Riveted stressed aluminum cladding. Aluminum cycle-type fenders, nose cone and hood. Engine: BMC A-series. America had 948cc or 1098cc engine to Healey Sprite specification. As Series 1, but using Triumph Herald uprights. Live rear axle now located by A-frame to bottom of diff with twin trailing arms. Drum brakes, 8" front and 7" rear. Triumph Herald steering rack mounted forward of the front axle. Revised Series I chassis with fewer tubes. Fiberglass fenders and nose cone. Top, spare wheel and wipers now standard. Larger fuel tank retained by steel straps. Battery moved from trunk to engine bay. Remote coolant filler standard. Engine: Ford 100E as Series 1. From Oct. 1961 Ford 105E 997cc 4-cyl., ohv. Bore: 80.96 turn. Stroke: 48.4 rum. Compression ratio: 8.9: 1. Twin HS2 carbs, 39 bhp at 5000 rpm. Weber carbs and fourbranch exhaust available optionally. Ford 4-speed Anglia box with 105E, 4.55:1 final drive standard. As Series 2A. Note: With introduction of the 105E engine, the 7A and America were dropped. Engine: Coventry Climax FWA 1098cc four-cylinder light alloy, SOHC. Bore: 72.4 mm. Stroke: 66.6 mm. Compression ratio: 9.8: 1. Twin SU H2 carbs. 75bhp at 6250 rpm. Transmission: BMC Austin A30 4-speed. Close-ratio gears optional. As 7F, except coolant filler neck in engine rather than through nose cone. Splined wire wheels, wood-rim steering wheel and tach standard. Speedometer optional. Engine: BMC A-series 948cc four-cylinder, ohv. Bore: 62.9 mm. Stroke: 76.2 mm. Compression ratio: 8.9: 1. Single SU carb. 37 bhp at 5200 rpm. Versions for USA called "Seven America" used Ausfin-Healey Sprite engine with 83: 1 compression, twin SU carbs, producing 43 bhp at 5200 rpm. Seven America had clarmshell front fenders in fiberglass rather than aluminum cycle-type, with semi-side screens, electric cooling fan, turn indicators and improved trim. should you buy a Seven?